Cessna will provide six Cessna 208B Grand Caravan EX aircraft, three spare Pratt & Whitney PT6A-140 engines, and aircraft spares and ground handling equipment to the U.S. Africa Command and Pacific Command areas of responsibility in support of counterterrorism measures in Chad, Cameroon, and the Philippines. "Work will be performed at Wichita, Kansas, and is expected to be complete by Sept. 30, 2017. This contract involves pseudo foreign military sales," the US DoD said. Funding for the acquisition is being provided through National Defense Authorization Act Section 2282. This provides the US Secretary of Defence with authority to train and equip foreign military forces for two specified purposes —counterterrorism and stability operations — and foreign security forces for counterterrorism operations. The Cessna 208 Caravan is a single-engined turboprop regional airliner and utility aircraft. The 208B Gran Caravan EX version, which has been certified in December 2012, powered by a 867 hp (647 kW) Pratt and Whitney Canada PT6A-140 that improves climb by 38%. 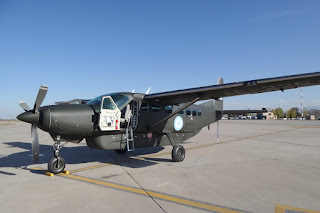 Cessna Grand Caravan EX 208 recently acquired by the Argentine Army.